Prices Start From Just £5499 + OTR The Coolest Cafe Racer On The Planet Has Just Welcomed Its TWIN Brother! And Guess What? It's Amazing! The New Continental GT650 Shares All Of The Endearing Qualities Of Its 535cc Brother - But Has More Power From The ALL NEW Engine. Featuring A 270 Degree Crank, Fuel Injection & Oil Cooling This Engine Has Been Developed In Britain With Fun In Mind! When The Designers Developed This Motor The Shape Look & Sound Where All Developed Simultaneously Until It looked, Sounded & Performed Perfectly! The 650 Is Set To Take The Modern Cafe Racer To Everyone As The Value RE Have Promised Will Make This Bike A Must Have! An All New Bike From The Ground Up - Although This Bike Shares The Character Of The 535GT Every Component Is New & Every Aspect Has Been Refined & Redeveloped. If You Have Ever Even Thought About A Cafe Racer - You Will Want A Bike That Is Fun To Ride, Easy To Personalise, Good Value And A Little Different. This Bike Ticks All Those Boxes! YES! FREE 3 years legal expense cover!, Part Exchange VERY Welcome, HPI Clear, All Bikes Come With Full Warranty & PDI, See One, Want One! The Coolest Cafe Racer On The Street Offers The Best Fun In Motorcycling And By Far The Best Value! This Lovely example has fitted, givi screen, Bar end mirrors, Stainless Motad Pipe, Open Down Pipe, Power Comander, Air Venturi, Tall Gearing, Our Own Design Stainless Chain Guard, Steel Mini Indicators. She's LOVELY! This Bike Will Be Carefully Prepared By Our RE Experts When Sold. We Love These Bikes SOOO Much - You Even Get A FREE Tee Shirt INspired By This Bike! We are an authorised Royal Enfield dealer stocking new bikes & accessories. Typical finance example, £699 deposit, 36 X £100.68 15.1 % APR Representative Total Amount Payable £4272.48 Finance Available STS & Is For Over 18's Only, Terms & Conditions Apply. Part Ex Welcome. FREE 3 years legal expense cover!, Part Exchange VERY Welcome, HPI Clear, All Bikes Come With Full Warranty & PDI, See One, Want One! 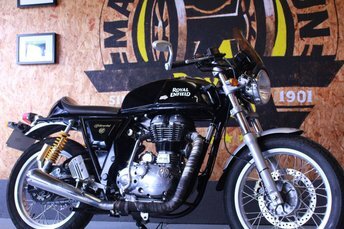 The Coolest Cafe Racer On The Street Offers The Best Fun In Motorcycling And By Far The Best Value! This Lovely example has fitted, givi screen, Bar end mirrors, Chrome reverse megaphone (Sounds MEGA!) & Thruxton stripes! Nationwide Delivery From £120 + VAT, Buy 24/7 By TEXT On 07970 777639 - Low Rate Finance From ZERO DEPOSIT, Typical PCP Example, £499 Deposit, Then 36 £63.43 Followed By A Final Payment Of £1775.50 Or Trade In - Or As This Is A GUARANTEED FUTURE VALUE, You Can Simply Return The Bike! Total Payable £4537.98 Including Deposit, Flat Rate 5.5 % APR 15 % Representative, PCP Example Based On 3000 Miles Per Year, Excess Mileage Charge May Apply (4 Pence Per Mile) Finance Is For Over 18'S Only Available STS, Terms & Conditions Apply. All Bike Sales Are Subject To £25 Transaction fee. 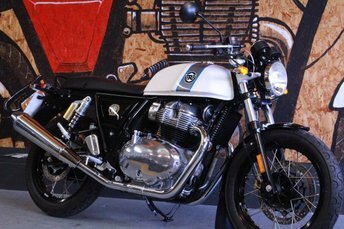 Get the best deal on a used Royal Enfield Continental GT bike for sale in Northampton by making your way to Cooperb Motorcycles Ltd today. You will find every available model listed here on the website, and as all our stock is competitively priced you should have no problem sourcing a pre-owned Royal Enfield to suit your budget. Take the opportunity to browse our current range online before contacting a member of the showroom team to find out more. Our friendly and knowledgeable staff will be more than happy to answer any questions and provide advice and guidance when necessary. 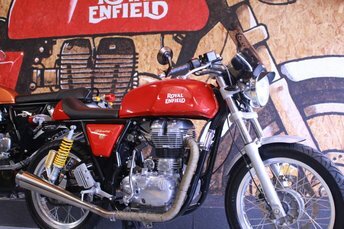 Alternatively, why not pay a visit to our showroom in person and take a closer look at the selection of used Royal Enfield Continental GT bike models for sale.